I did finish making the ebook of Null_Pointer this weekend. My graphic designer is working up some cover thumbnails and I might get a peak at them tomorrow. I just wanted to document that the epub was completed in less than three days in my spare time. 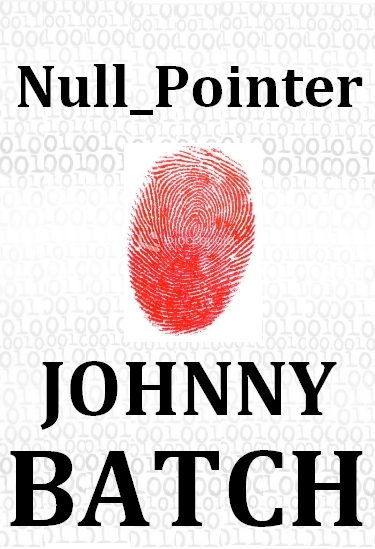 Wrapped up the ebook version of Null_Pointer this morning. All I need now is the cover art and it’s done. I can’t recommend Sigil enough for ebook creation. Once you are finished with your manuscript, put it in one big RTF file and then simply cut and past chapters into Sigil. I created my own style sheet and will use it for all my novels. One of the things I had in the manuscript were comment lines between scene breaks. They look like this /*———-*/ and any programmer can tell you that comment lines are how you hide comments in computer code. I originally had these much longer and when the ebook was viewed on a phone or ereader, it tended to wrap around and look terrible. So I shortened them to ten dashes. Other lessons learned from my ebook creation include: always make separate pages for each chapter and or section break, like contents or dedication, and make sure you size your cover art to fit on a phone. There, now run along and start making your own ebooks. 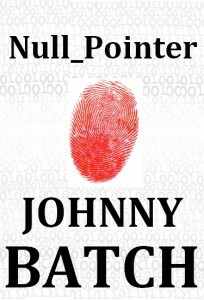 This week I’ve started to build up the xhtml pages that will become my first Mystery novel – Null_Pointer. I spoke with the cover artist and he’s working on finishing that up. For ebook creation, I use a program called Sigil. It’s Open Source and works on all platforms. If making ebooks is in your future you might want to give it a try. The manuscript endured one final edit this week to take care of bugs that the Beta Readers and advanced readers have caught. Lesson for all you Indie writers out there; find the smartest folks you can to read your final edit. They will save you from looking bad, every time. My goal is to complete the epub this weekend and then work with the graphic designer to finish up the cover. Below is the working design for it. Fonts and images will be tweaked but the over-all look is pretty final. I listen to nerdcore and if you code, you might want to listen to it too. It’s not the same as pop music or hip hop but usually its produced by and for coders. So there are lots of references to programming in the lyrics. My first exposure to nerdcore was with the classic Monzy video – Kill -9. For UNIX references and nerdy inside rimes you can’t get any better. And yes, I loved the title so much I’m using it for my next novel. One of my favorite Nerdcore rappers is the queen of nerdcore – MC ROUTER. Her first and best song in my book was Control Panel. “Hell no you can’t level up on my chest!” Love that line. There are plenty of other Nerdcore artists out there, go find them. You may decide that you like nerdy music. Vi or Emacs? It’s one of those comment and IRC saws in the developer community. At least the UNIX developer community. Windows guys argue over – what? Visual Studio vs Notepad? Same for Mac developers. Nothing used to start a bitter flame war better than Vi or Emacs questions. For a while there, I used to care about such nonsense. Not so much anymore. Now it’s what is the best tool for the job, that’s what I’ll use. 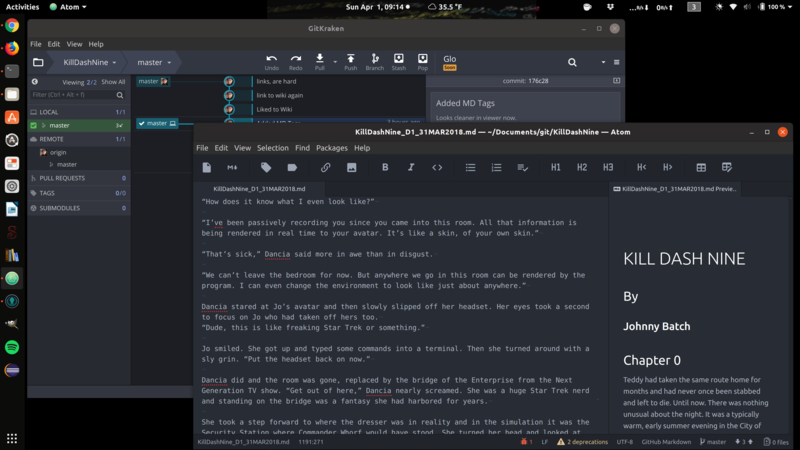 If I’m on Windows and doing scripting, usually that’s Notepad ++, if I’m on Linux, Gedit. In a terminal, Vi. It’s important to be familiar with your tools and how to use them, but it’s not important which tool is the best. Arguing over such things is not going to make you a better programmer. I’m using the WordPress theme called Thematic for this blog. It can be extended and changed quite extensively, but the default look is simple and clean. Almost Zen in it’s spartan use of graphics and liberal use of white space. I’m beginning to like it just the way it is. Oh sure, when I start getting closer to launching Kill Dash Nine, I’ll have to jazz it up a bit to show off the new book, but for now, I like it clean and simple. I have already adjusted the basic template in Thematic to make the header have less headroom. But for now, that is my only change. My current WIP (Work In Progress) is a mystery about a programmer sleuth named Joshua Jones. The novel will be called Kill Dash Nine, or KD9 for short. Anyone worth their weight in salt will know that the title is a UNIX command (kill -9). Civilian readers will think the title refers to nine people being killed, and they will be correct. Nice how that works out. The blending of geek culture and murder mysteries is my forte. Not many crime or mystery writers are using programmers as their heroes. Why that is I’m not exactly sure. Many aspects of being a programmer are similar to being a good detective. In fact, when code breaks down, all programmers are detectives until they can completely debug the errors that lead to the breakage. KD9 has a very dark soul and the topics it explores are disquieting. So most mystery readers will love it. But it also has plenty of tech flavored goo in the middle, to keep nerds like me into the story. It will also not be your typical, lazy summer read. You might learn something and it might require you to think about the topics explored in the book. Consider me like a command interpreter and this blog a collection of my files containing commands intended to be executed by my readers. These commands are akin to enjoy the story, learn something, and think about technology and how it affects you. Those are the goals of my blog and my fiction. I hope you come along with me on this journey of discovery and intrigue.